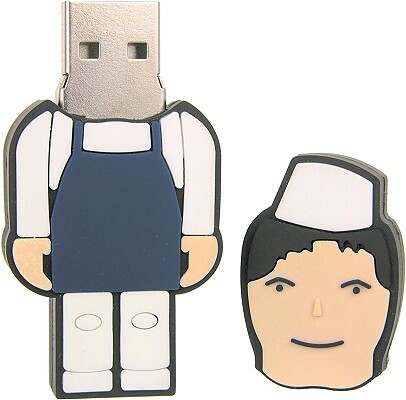 Character USB Stick Lady custom as a Branded Promotional Gift. Represent your workforce with character USB sticks. This usb stick character is a lady who serves customers in a retail outlet but take it as an example of the sort of USB stick character you can devise yourself. Choose you own colour scheme and your company logo can be part of the mould standing out in relief. This is an example of what we mean by a 2D (two dimensional) custom USB stick because it a sandwich of two pieces of PCV or silicon rubber with flat surfaces. This one has the promotional brand name printed on the flat rear surface. All our character usb drives are actually Custom Shape USB sticks so you will find them in that section too. Please ask Crazy Dave for more details and a price for whatever quantity you have in mind.